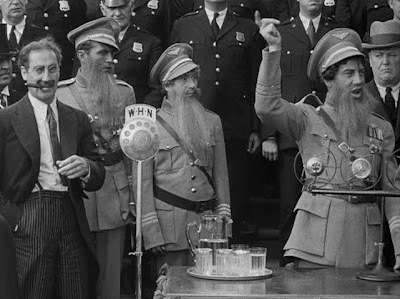 Thanks to my dad, I did grow up at least knowing of the Marx Brothers (I remember distinctly watching Duck Soup, which is luckily further up on this list -- can't wait to revisit!) and their style of broad, wacky comedy is near and dear to my heart. 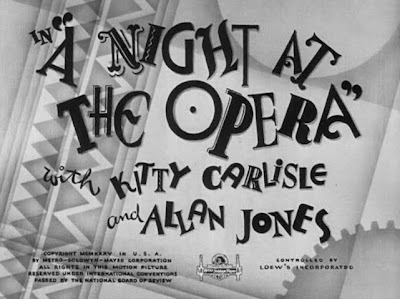 A Night at the Opera, filmed at the height of their careers, was their first film without their brother Zeppo (Groucho, Chico and Harpo remained) and proved to be even more popular at the time than Duck Soup, which is now regarded as their best film. Company: just me. I should have taken this opportunity to invite people over for a comedy. That'll learn me. Cuisine: my own special concoction: a Roma sausage and pepperoni pizza ($1.80!) with roma tomato, spinach, red onion and mozzarella added. Insta-health? Plus a Leinenkugel's. Delight. "Is it just me, or is it starting to get crowded in here?" 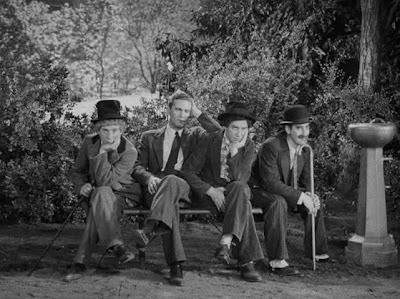 The Marx Brothers started out in vaudeville and sketch comedy, slowly developing very distinct personas and using them throughout their film careers, and gradually found their niche in satire. They seem in their films to find their way into high society and then break it down from the inside out. In this film, they invade the high-art world of opera. All three of them were also talented musicians: there's a long section near the middle of the film where Chico and Harpo both play amazing piano solos, much to the delight of onlookers, and Harpo strums the harp like no one you've ever seen. 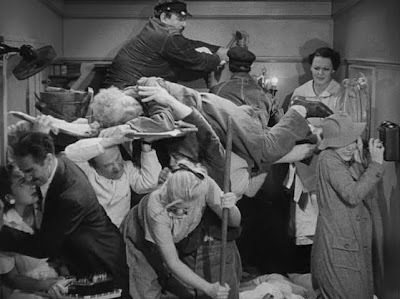 Essentially, though, the film's plot serves as a jumping off point for their sketches, including this famous one where fifteen people are crammed into a tiny already-crowded room. When the last person opens the door, all of them spill out, and the scene fades to black, making the film feel more like a series of jokes than an actual coherent film. I think that might be one fault of the film: the opera singers whose story makes up the real non-Marx plot are not really what the audience is watching the film for, and their scenes feel like time wasters between the funny scenes. What are they for? Couldn't you just give us what we want? Up until this point, all of their films had been released by Paramount, and for some reason they switched over to MGM for this one and never looked back -- perhaps that has something to do with it? There are also several moments in the film where the picture seems to cut away quickly and then come back. Is it something to do with film preservation? We're talking a 75-year-old movie here. One thing I love about these old movies is the way the score is used. I noticed, particularly over the opening credits, that the score is oversized and melodramatic. Every note is played for its full dramatic value, and you get the sense that we are in for an intense ride. But it's not long before this film that talkies were introduced -- maybe less than ten years, right? The Jazz Singer was 1927? -- and the score was all you got. It did all the leg work. That certainly carries over here, and helped along by the subject material. Movie music is at its best when it sets a mood, but when punctuating jokes, the score can be inspired. The anarchy ensuing by the end of the film can almost make you feel bad for anyone who gets in the brothers' way. They had been criticized for raising hell for innocent bystanders in their storylines, but it seems like the world of opera is on trial here, and so anyone involved is fair game. 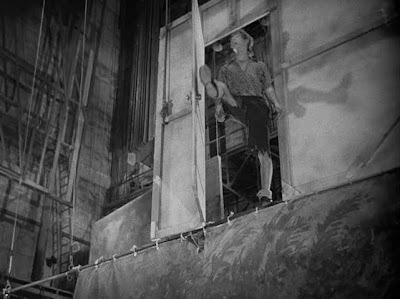 The backstage hijinx are especially impressive, even by today's standards, especially because there's no discernible special effects happening. That's all them. I can't help but think about the fly rails backstage at the theater where I work, and all the trouble I'd get in if I pulled those shenanigans. Those hoodlums! I have wait twenty-five more movies to get to the other Marx film on the list at #60, so by then I can hopefully provide more interesting insight. For now, this is what you get. Up next: arguably the film I know the least about so far, 1969's Easy Rider.